The home front in World War One has been rather neglected by researchers, but as we saw from last week’s post on cookery in war-time, the Tower collection contains a wealth of material on the subject. 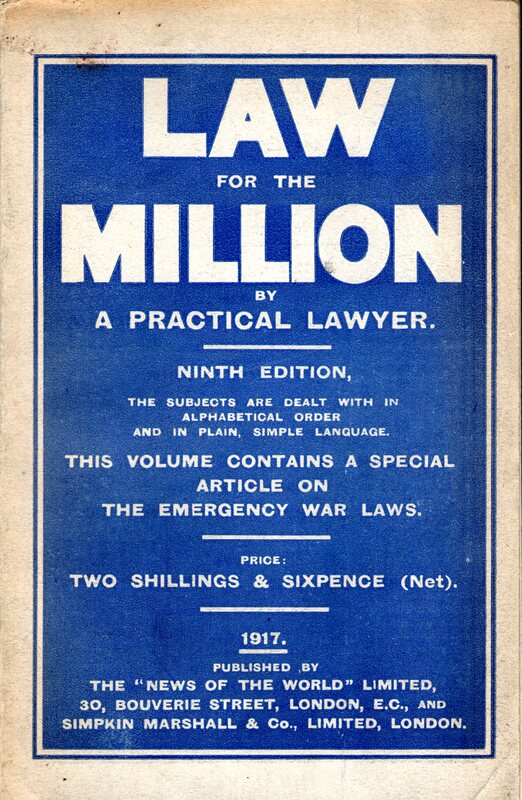 This 1917 edition of the News of the World’s Law for the Million, with its special section on the emergency war legislation does give us a flavour of the time. Interestingly, much of the legislation introduced during the war remained in force for many years, and some is still affecting us today. This is the ninth edition of a title first published in 1905. In those days the News of the World used to give advice on what to do if libelled in a newspaper! Even then they were using the public interest defence – that there could be no action against “fair and reasonable comment and criticism … on the actions of public men such as politicians and actors”. The War-time law” section runs to just 30 pages in a 350 page volume, arranged alphabetically from Advertisements to Yachting. The new laws would have affected almost everyone, especially those living in big cities and the major ports. The best known piece of wartime legislation is the infamous Defence of the Realm Act (DORA), passed in August 1914. It gave the government wide ranging powers to requisition land and buildings, and introduced a range of new offences including kite flying, lighting bonfires, buying binoculars, and keeping carrier pigeons. There were strict controls on the sale of alcoholic drinks – pubs could only open for six hours a day (12.00 to 3.00 and 6.30-9.30). The ridiculous afternoon gap in opening hours remained in force until the 1980s. Drugs – Early in the war it was possible to send gifts of cocaine and opiates to soldiers and sailors. From 1916 a doctor’s prescription was required, and illegal possession was made an offence punishable by six months imprisonment and/or a fine of £100. Food control – By 1917 the effects of three years of war can be clearly seen. There was no official rationing until 1918, but there were strict rules on the production and sale of food. The Bread Order (1917) was particularly draconian. No sugar could be used in the making of bread, and currant bread, sultana bread and milk bread could not be sold. The sale of light pastry, muffins, crumpets and tea-cakes was entirely prohibited, and the amount of flour used in buns, scones, and biscuits was strictly limited. Cakes and pastries could not be covered or coated in sugar or chocolate. Hotels and restaurants had to have meatless days – no meat, poultry or game could be served in London on Tuesdays, or on Wednesdays in other parts of the country. Potatoes could only be served on meatless days and Fridays – so the Government wasn’t brave enough to deprive people of their fish and chips on a Friday! 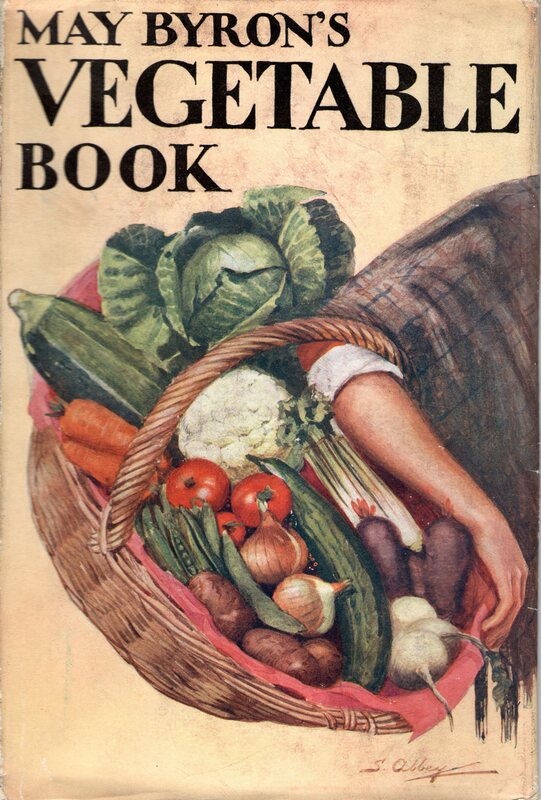 Although these laws did not apply to home cooking, the library has many books on vegetarian and meatless cookery from this dating from this period. Air raids – In 1916 new laws were introduced to counter the effects of air raids. Stringent blackout regulations came into force, and there was even a law against the acquisition of air raid souvenirs. The finder of any item (including bombs) dropped, or lost from a hostile aircraft had to report the find to the police or the military, and “give up the article if required”. It would be interesting to learn how rigorously some of these laws were enforced. Was it possible to buy chocolate cake? How did the British public react to meatless days, and what alternatives did they find to the potato? Most interesting. Any stuff on Bassingbourn Alan? Considering later Bassingbourn residents’ fondness for Abbot Ale, I suspect that they wouldn’t have been too keen on any laws that restricted their drinking time. Prising them out of the Hoops at 9.30 pm must have been a struggle! Great to hear from you – keep in touch.